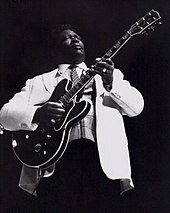 King was inducted into the Rock and Roll Hall of Fame in 1987, and is considered one of the most influential blues musicians of all time, earning the nickname "The King of the Blues", and is considered one of the "Three Kings of the Blues Guitar" (along with Albert and Freddie King). King was known for performing tirelessly throughout his musical career, appearing on average at more than 200 concerts per year into his 70s. In 1956 alone, he reportedly appeared at 342 shows. King was born on a cotton plantation in Itta Bena, Mississippi, and later worked at a cotton gin in Indianola, Mississippi. He was attracted to music and the guitar in church, and began his career in juke joints and local radio. He later lived in Memphis, Tennessee, and Chicago, and toured the world extensively. King died at the age of 89 in Las Vegas, Nevada, on May 14, 2015. Riley B. King was born on September 16, 1925, on the Berclair cotton plantation near the town of Itta Bena, Mississippi, the son of sharecroppers Albert and Nora Ella King. He considered the nearby city of Indianola, Mississippi to be his home. When King was four years old, his mother left his father for another man, so he was raised by his maternal grandmother, Elnora Farr, in Kilmichael, Mississippi. While young, King sang in the gospel choir at Elkhorn Baptist Church in Kilmichael. King was attracted to the Pentecostal Church of God in Christ because of its music. The local minister performed with a Sears Roebuck Silvertone guitar during services. The minister taught King his first three chords. It seems that at the age of 12 he purchased his first guitar for $15.00, although another source indicates he was given his first guitar by Bukka White, his mother's first cousin (King's grandmother and White's mother were sisters). In November 1941, "King Biscuit Time" first aired, broadcasting on KFFA in Helena, Arkansas. It was a radio show featuring the Mississippi Delta blues. King listened to it while on break at a plantation. A self-taught guitarist, he then wanted to become a radio musician. In 1943, King left Kilmichael to work as a tractor driver and play guitar with the Famous St. John's Gospel Singers of Inverness, Mississippi, performing at area churches and on WGRM in Greenwood, Mississippi. In 1946, King followed Bukka White to Memphis, Tennessee. White took him in for the next ten months. However, King returned to Mississippi shortly afterward, where he decided to prepare himself better for the next visit, and returned to West Memphis, Arkansas, two years later in 1948. He performed on Sonny Boy Williamson's radio program on KWEM in West Memphis, where he began to develop an audience. King's appearances led to steady engagements at the Sixteenth Avenue Grill in West Memphis, and later to a ten-minute spot on the Memphis radio station WDIA. The radio spot became so popular that it was expanded and became the Sepia Swing Club. He worked at WDIA as a singer and disc jockey, where he was given the nickname "Beale Street Blues Boy", later shortened to "Blues Boy", and finally to B.B. It was there that he first met T-Bone Walker. King said, "Once I'd heard him for the first time, I knew I'd have to have [an electric guitar] myself. 'Had' to have one, short of stealing!" In 1949, King began recording songs under contract with Los Angeles-based RPM Records. Many of King's early recordings were produced by Sam Phillips, who later founded Sun Records. Before his RPM contract, King had debuted on Bullet Records by issuing the single, "Miss Martha King" (1949), which did not chart well. "My very first recordings [in 1949] were[sic] for a company out of Nashville called Bullet, the Bullet Record Transcription company," King recalled. "I had horns that very first session. I had Phineas Newborn on piano; his father played drums, and his brother, Calvin, played guitar with me. I had Tuff Green on bass, Ben Branch on tenor sax, his brother, Thomas, on trumpet, and a lady trombone player. The Newborn family were the house band at the famous Plantation Inn in West Memphis." King assembled his own band; the B.B. King Review, under the leadership of Millard Lee. The band initially consisted of Calvin Owens and Kenneth Sands (trumpet), Lawrence Burdin (alto saxophone), George Coleman (tenor saxophone), Floyd Newman (baritone saxophone), Millard Lee (piano), George Joyner (bass) and Earl Forest and Ted Curry (drums). Onzie Horne was a trained musician elicited as an arranger to assist King with his compositions. By his own admission, King could not play chords well and always relied on improvisation. King's recording contract was followed by tours across the United States, with performances in major theaters in cities such as Washington, D.C., Chicago, Los Angeles, Detroit, and St. Louis, as well as numerous gigs in small clubs and juke joints of the southern United States. During one show in Twist, Arkansas, a brawl broke out between two men and caused a fire. He evacuated along with the rest of the crowd but went back to retrieve his guitar. He said he later found out that the two men were fighting over a woman named Lucille. He named the guitar Lucille, as a reminder not to fight over women or run into any more burning buildings. Following his first Billboard Rhythm and Blues charted number one, "3 O'Clock Blues" (February 1952), B.B. King became one of the most important names in R&B music in the 1950s, amassing an impressive list of hits including "You Know I Love You", "Woke Up This Morning", "Please Love Me", "When My Heart Beats like a Hammer", "Whole Lotta Love", "You Upset Me Baby", "Every Day I Have the Blues", "Sneakin' Around", "Ten Long Years", "Bad Luck", "Sweet Little Angel", "On My Word of Honor", and "Please Accept My Love". This led to a significant increase in his weekly earnings, from about $85 to $2,500, with appearances at major venues such as the Howard Theater in Washington and the Apollo in New York, as well as touring the "Chitlin' circuit". 1956 became a record-breaking year, with 342 concerts booked and three recording sessions. That same year he founded his own record label, Blues Boys Kingdom, with headquarters at Beale Street in Memphis. There, among other projects, he was a producer for artists such as Millard Lee and Levi Seabury. In 1962, King signed to ABC-Paramount Records, which was later absorbed into MCA Records (which itself was later absorbed into Geffen Records). In November 1964, King recorded the Live at the Regal album at the Regal Theater. King later said that Regal Live "is considered by some the best recording I've ever had . . . that particular day in Chicago everything came together . . ."
From the late 1960s, new manager Sid Seidenberg pushed King into a different type of venue as blues-rock performers like Eric Clapton (once a member of The Yardbirds, as well as Cream), and Paul Butterfield were popularizing an appreciation of blues music among white audiences. King gained further visibility among rock audiences as an opening act on the Rolling Stones' 1969 American Tour. He won a 1970 Grammy Award for his version of the song "The Thrill Is Gone;" which was a hit on both the Pop and R&B charts. It also gained the number 183 spot in Rolling Stone magazine's 500 Greatest Songs of All Time. King was inducted into the Blues Hall of Fame in 1980, the Rock and Roll Hall of Fame in 1987, and the Official Rhythm & Blues Music Hall of Fame in 2014. In 2004, he was awarded the international Polar Music Prize, given to artists "in recognition of exceptional achievements in the creation and advancement of music." From the 1980s to his death in 2015, he maintained a highly visible and active career, appearing on numerous television shows and sometimes performing 300 nights a year. In 1988, King reached a new generation of fans with the single "When Love Comes to Town," a collaborative effort between King and the Irish band U2 on their Rattle and Hum album. In December 1997, he performed in the Vatican's fifth annual Christmas concert and presented his trademark guitar "Lucille" to Pope John Paul II. In 1998, he appeared in The Blues Brothers 2000, playing the part of the lead singer of the Louisiana Gator Boys, along with Eric Clapton, Dr. John, Koko Taylor and Bo Diddley. In 2000, he and Clapton teamed up again to record Riding With the King, which won a Grammy Award for Best Traditional Blues Album. Discussing where he took the Blues, from "dirt floor, smoke in the air" joints to grand concert halls, King said the Blues belonged everywhere beautiful music belonged. He successfully worked both sides of the commercial divide, with sophisticated recordings and "raw, raucous" live performance. In 2006, King went on a "farewell" world tour, although he remained active afterward. The tour was partly supported by Northern Irish guitarist, Gary Moore, with whom King had previously toured and recorded. It started in the United Kingdom, and continued with performances at the Montreux Jazz Festival and in Zürich at the Blues at Sunset. During his show in Montreux at the Stravinski Hall, he jammed with Joe Sample, Randy Crawford, David Sanborn, Gladys Knight, Leela James, Andre Beeka, Earl Thomas, Stanley Clarke, John McLaughlin, Barbara Hendricks and George Duke. In June 2006, King was present at a memorial of his first radio broadcast at the Three Deuces Building in Greenwood, Mississippi, where an official marker of the Mississippi Blues Trail was erected. The same month, a groundbreaking was held for a new museum, dedicated to King, in Indianola, Mississippi. The B.B. King Museum and Delta Interpretive Center opened on September 13, 2008. In late October 2006, King recorded a concert album and video entitled B.B. King: Live at his B.B. King Blues Clubs in Nashville and Memphis. The video of the four-night production featured his regular B.B. King Blues Band and captured his show as he performed it nightly around the world. Released in 2008, they documented his first live performances in over a decade. In 2007, King played at Eric Clapton's second Crossroads Guitar Festival and contributed the songs "Goin' Home", to Goin' Home: A Tribute to Fats Domino (with Ivan Neville's DumpstaPhunk) and "One Shoe Blues" to Sandra Boynton's children's album Blue Moo, accompanied by a pair of sock puppets in a music video for the song. In the summer of 2008, King played at the Bonnaroo Music and Arts Festival in Manchester, Tennessee, where he was given a key to the city. Also in 2008, he was inducted into the Hollywood Bowl Hall of Fame. King performed at the Mawazine festival in Rabat, Morocco, on May 27, 2010. In June 2010, King performed at the Crossroads Guitar Festival with Robert Cray, Jimmie Vaughan, and Eric Clapton. He also contributed to Cyndi Lauper's album Memphis Blues, which was released on June 22, 2010. In 2011, King played at the Glastonbury Music Festival, and in the Royal Albert Hall in London, where he recorded a concert video. Rolling Stone ranked King at No. 6 on its 2011 list of the 100 greatest guitarists of all time. On February 21, 2012, King was among the performers of "In Performance at the White House: Red, White and Blues," during which President Barack Obama sang part of "Sweet Home Chicago". King recorded for the debut album of rapper and producer Big K.R.I.T., who also hails from Mississippi. On July 5, 2012, King performed a concert at the Byblos International Festival in Lebanon. On May 26, 2013, King appeared at the New Orleans Jazz Festival. On October 3, 2014, after completing his live performance at the House of Blues in Chicago, a doctor diagnosed King with dehydration and exhaustion, and the eight remaining shows of his ongoing tour had to be cancelled. King didn't schedule any additional shows for the remainder of the year. When I sing, I play in my mind; the minute I stop singing orally, I start to sing by playing Lucille. For more information about King's guitar, see Lucille (guitar). B.B. King used equipment characteristic of the different periods he played in. He played guitars made by various manufacturers early in his career. He played a Fender Esquire on most of his recordings with RPM Records. However, he was best known for playing variants of the Gibson ES-355. In the September edition 1995 of Vintage Guitar magazine, early photos show him playing a Gibson ES-5 through a Fender tweed amp. In reference to the photo, B.B. King stated, "Yes; the old Fender amplifiers were the best that were ever made, in my opinion. They had a good sound and they were durable; guys would throw them in the truck and they’d hold up. They had tubes, and they’d get real hot, but they just had a sound that is hard to put into words. The Fender Twin was great, but I have an old Lab Series amp that isn’t being made anymore. I fell in love with it, because its sound is right between the old Fender amps that we used to have and the Fender Twin. It’s what I’m using tonight." He later moved on from the larger Gibson hollow bodied instruments which were prone to feedback when played a high volumes to various semi-hollow models beginning first with the ES-335 and then a deluxe version called the ES-355 which employed a stereo option. In 1980, Gibson Guitar Corporation launched the B.B. King Lucille model, a ES-355 with stereo options, a varitone selector and fine tuners (neither of which were actually utilized by B.B.) and, at King's direct request, no f-holes to further reduce feedback. In 2005, Gibson made a special run of 80 Gibson Lucilles, referred to as the "80th Birthday Lucille", the first prototype of which was given as a birthday gift to King, and which he used thereafter. King used a Lab Series L5 2×12" combo amplifier and had been using this amplifier for a long time. It was made by Norlin Industries for Gibson in the 1970s and 1980s. Other popular L5 users are Allan Holdsworth and Ty Tabor of King's X. The L5 has an onboard compressor, parametric equalization, and four inputs. King also used a Fender Twin Reverb. He used his signature model strings "Gibson SEG-BBS B.B. King Signature Electric Guitar Strings" with gauges: 10–13–17p–32w–45w–54w and D'Andrea 351 MD SHL CX (medium 0.71mm, tortoise shell, celluloid) picks. In 1991, Beale Street developer John Elkington recruited B.B. King to Memphis to open the original B.B. King's Blues Club, and in 1994, a second club was launched at Universal Citywalk in Los Angeles. A third club in New York City's Times Square opened in June 2000 but closed on April 29, 2018. Management is currently in the process of finding a new location in New York City. Two more clubs opened, at Foxwoods Casino in Connecticut in January 2002, and in Nashville in 2003. Another club opened in Orlando in 2007. A club in West Palm Beach opened in the fall of 2009 and an additional one, based in the Mirage Hotel, Las Vegas, opened in the winter of 2009. Another opened in the New Orleans French Quarter in 2016. King made guest appearances in numerous popular television shows, including The Cosby Show, The Young and the Restless, General Hospital, The Fresh Prince of Bel-Air, Sesame Street, Married... with Children, Sanford and Son, and Touched by an Angel. In 2000, the children's show, Between The Lions, featured a singing character named "B.B. the King of Beasts", modeled on the real King. B.B. King: The Life of Riley, a feature documentary about King narrated by Morgan Freeman and directed by Jon Brewer, was released on October 15, 2012. King, who was diabetic, appeared in several television commercials for OneTouch Ultra, a blood glucose monitoring device, in the 2000s and early 2010s. He appeared in 1995 in a McDonald's commercial with Australian guitarist Nathan Cavaleri, and then in a commercial for the Toyota Camry with his guitar Lucille. King was married twice, to Martha Lee Denton, November 1946 to 1952, and to Sue Carol Hall, 1958 to 1966. The failure of both marriages has been attributed to the heavy demands made by King's 250 performances a year. It is reported that he fathered 15 children with several different women. After his death, three more have come forward, claiming King as their father as well. Though neither of his marriages produced children, and biographer Charles Sawyer wrote that doctors found his sperm count too low to conceive children, King never disputed paternity of any of the 15 who claimed it, and by all accounts was generous in bankrolling college tuitions and establishing trust funds. In May 2016, the 11 surviving children initiated legal proceedings against King's appointed trustee over his estimated $30 million to $40 million estate. Several of them also went public with the allegation that King's business manager, LaVerne Toney, and his personal assistant, Myron Johnson, had fatally poisoned him. Autopsy results showed no evidence of poisoning. A defamation suit filed by Johnson against the accusing family members (including his own sister, Karen Williams) is pending. Other children have filed lawsuits targeting King's music estate, which remains in dispute. King's favorite singer was Frank Sinatra. In his autobiography he spoke about how he was a "Sinatra nut" and how he went to bed every night listening to Sinatra's classic album In the Wee Small Hours. During the 1960s Sinatra had arranged for King to play at the main clubs in Las Vegas. He credited Sinatra for opening doors to black entertainers who were not given the chance to play in "white-dominated" venues. In September 1970, King recorded Live in Cook County Jail, during a time in which issues of race and class in the prison system were prominent in politics. King also co-founded the Foundation for the Advancement of Inmate Rehabilitation and Recreation, tying in his support for prisoners and interest in prison reform. In addition to prison reform, King also wanted to utilize prison performances as a way to preserve music and songs in a similar way that Alan Lomax did. In 2002, King signed on as an official supporter of Little Kids Rock, a nonprofit organization that provides free musical instruments and instruction to children in underprivileged public schools throughout the United States. He sat on the organization's Honorary Board of Directors. In the 2000s to early 2010s, King was also involved in a diabetes awareness campaign with American Idol contestant, Crystal Bowersox, with One Touch Ultra, starring in commercials promoting diabetes health management. The remaining eight shows of his 2014 tour were cancelled because of health problems caused by complications from high blood pressure and diabetes. King died in his sleep on May 14, 2015, at the age of 89, from vascular dementia caused by a series of small strokes as a consequence of his type 2 diabetes. Two of his daughters alleged that King was deliberately poisoned by two associates trying to induce diabetic shock, however an autopsy showed no evidence of poisoning. On May 27, 2015, King's body was flown to Memphis. A funeral procession went down Beale Street, with a brass band marching in front of the hearse, playing "When the Saints Go Marching In." Thousands lined the streets to pay their last respects. His body was then driven down Route 61 to his hometown of Indianola, Mississippi. He was laid in repose at the B.B. King Museum and Delta Interpretive Center, in Indianola, for people to view his open casket. The funeral took place at the Bell Grove Missionary Baptist Church in Indianola, on May 30. He was buried at the B.B. King Museum. Years reflect the year in which the Grammy was awarded, for music released in the previous year. 1995: The Kennedy Center Honors; given to recognize "the lifelong accomplishments and extraordinary talents of our nation's most prestigious artists"
1998: Grammy Hall of Fame Award for "The Thrill is Gone"; the award is given to recordings that are at least 25 years old and that have "qualitative or historical significance"
2004: The Royal Swedish Academy of Music awarded him the Polar Music Prize for his "significant contributions to the blues"
^ Adelt, Ulrich (2010). Blues Music in the Sixties: A Story in Black and White. Rutgers University Press. pp. 24 and 26. ISBN 978-0-8135-4750-3. ^ Komara, Edward M. Encyclopedia of the Blues, Routledge, 2006, p. 385. ^ Trovato, Steve. "Three Kings of Blues". Hal Leonard. Retrieved March 12, 2013. ^ Leonard, Michael. "3 Kings of the Blues". Gibson. Retrieved March 12, 2013. ^ "Happy Birthday to "The Velvet Bulldozer" Albert King". WCBS FM. CBS. April 25, 2011. Retrieved March 12, 2013. ^ a b "B.B. King Biography". Rock and Roll Hall of Fame. Retrieved May 15, 2015. ^ "Blues Guitarist B.B. King Dies at 89". Los Angeles Times. May 14, 2015. Retrieved May 15, 2015. ^ a b Herzhaft, Gérard (1997). "B. B. King". Encyclopedia of the Blues. Translated by Brigitte Debord (2nd ed.). Fayetteville, Ark. : University of Arkansas Press. pp. 108–110. ISBN 1610751396. ^ Dahl, Bill. "B.B. King". AllMusic.com. Retrieved May 31, 2015. ^ a b c d e f g Troupe, Quincy (June 4, 1958). "BB King: American Blues Musician, b. 1925". Jazzandbluesmasters.com. Retrieved February 17, 2010. ...was born on a cotton plantation, in Itta Bene [sic], Mississippi, just outside the delta town of Indianola. ^ Silliman, Daniel (May 15, 2015). "How the church gave B.B. King the blues". The Washington Post. Retrieved July 2, 2015. ^ Kostelanetz, Richard; Reiswig, Jesse, eds. (2005). The B.B. King Reader: 6 Decades of Commentary (2nd ed.). Milwaukee, WI: Hal Leonard. p. 4. ISBN 0-634-09927-2. ^ a b Weiner, Tim (May 15, 2015). "B. B. King, Defining Bluesman for Generations, Dies at 89". The New York Times. Retrieved May 15, 2015. ^ "B.B. King: National Visionary". National Visionary Leadership Project. Retrieved June 3, 2011. ^ "Historical marker placed on Mississippi Blues Trail". Pittsburgh Post-Gazette. Associated Press. January 25, 2007. Archived from the original on June 4, 2011. Retrieved June 3, 2011. ^ "B.B. King - KWEM 1948". KWEM Radio. Retrieved May 15, 2015. ^ Encyclopedia of African American Popular Culture. Edited by Jessie Carney Smith. ABC-CLIO, Santa Barbara, California. 2011. ISBN 978-0-313-35796-1 : Page 805-6. ^ Note: "B.B." is normally written with periods and without a space between the letters. ^ History of Rock & Roll. By Thomas E. Larson. Kendall/Hunt, Dubuque, Iowa. 2004. ISBN 978-0-7872-9969-9 : Page 25. ^ "Blues Access Interview". Retrieved September 12, 2014. ^ "George Coleman: This Gentleman can PLAY". All About Jazz. Retrieved February 17, 2010. ^ U2 Rattle and Hum DVD, 1988. ^ "Bluesobit: BB King". No Rock And Roll Fun. Retrieved 15 May 2015. ^ Kerekes, Jim; O'Neill, Dennis (January 3, 1997). "B.B. King: Lucille Speaks". Archived from the original on November 16, 2011. ^ "B.B. King: Biography and Much More from". Answers.com. Retrieved May 16, 2011. ^ a b c Sawyer, Charles. "The Life of Riley". President and Fellows of Harvard College. Retrieved October 5, 2014. ^ Kostelanetz 1997, p. 146. ^ "B.B. King Biography". BBKing.com. Retrieved May 15, 2015. ^ a b Greg Kot (May 16, 2015). "King of the Blues". Chicago Tribune. p. 1 and 5. ^ McArdle, Terence (May 15, 2015). "B.B. King, Mississippi-born master of the blues, dies at 89". The Washington Post. Retrieved May 30, 2015. ^ McShane, Larry (May 15, 2015). "B.B. King Dead at 89: Blues guitarist whose sound defined music for generations passes away in sleep". New York Daily News. Retrieved May 15, 2015. ^ "Rolling Stone Magazine Lists 500 Greatest Songs of All Time". Sun Records. July 15, 2010. Retrieved May 15, 2015. ^ Rothman, Michael (May 15, 2015). "Blues Icon B.B. King Dead at Age 89". ABC News. Retrieved May 15, 2015. ^ a b "B. B. King: Laureate of the Polar Music Prize 2004". Polar Music Prize. Retrieved 15 May 2015. ^ "B.B. KING Gives His Prized Electric Guitar "Lucille" to Pope John Paul II During a Private Audience". ITN Source. Dec 18, 1997. Retrieved May 15, 2015. ^ "B.B. King's "Lucille" to the Pope After Vatican Concert". MTV News. Retrieved 2018-03-06. ^ Ritter, Ken (May 15, 2015). "'King of the Blues' blues legend B.B. King dead at age 89". KUSI News. Retrieved May 15, 2015. ^ Brown, Mick (May 18, 2009). "BB King Interview: The Last of the Great Bluesmen". The Daily Telegraph. London. Retrieved May 15, 2015. ^ a b "BB King Farewells Montreux". The Sydney Morning Herald. July 5, 2006. Retrieved May 15, 2015. ^ "B.B. King Museum and Delta Interpretive Center". Bbkingmuseum.org. Archived from the original on February 6, 2010. Retrieved February 17, 2010. ^ John F. Ross "B.B. Gets His Own Museum," American Heritage, Winter 2009. ^ Melzer, Ashley (September 11, 2008). "B.B. King Museum to open this Saturday". Paste Magazine. Retrieved May 15, 2015. ^ "B.B. KING LIVE IN YOUR OWN HOME". IGN. January 15, 2008. Retrieved May 15, 2015. ^ "28 July 2007 – Crossroads Guitar Festival". Where's Eric!. Retrieved May 15, 2015. ^ Chinen, Nate (September 22, 2007). "Stars Join Forces to Salute (and Support) a Rock Legend". The New York Times. Retrieved May 15, 2015. ^ "B.B. King – One Shoe Blues". Kaleidoscope Pictures. Retrieved May 15, 2015. ^ Coyle, Jake (June 14, 2008). "B.B. King Given Key to the City at Bonnaroo". USA Today. Retrieved May 15, 2015. ^ "Opening Night at the Bowl". Hollywood Bowl. Archived from the original on May 18, 2015. Retrieved May 15, 2015. ^ "Official Site". B.B. King. Archived from the original on January 2, 2012. Retrieved December 30, 2011. ^ Dirks, Rebecca (June 27, 2010). "Reporting From Eric Clapton's Crossroads Guitar Festival 2010". Premier Guitar. Retrieved May 15, 2015. ^ Baca, Ricardo (September 23, 2010). "The Reverb Interview: Cyndi Lauper". Hey Reverb. Retrieved May 15, 2015. ^ Goff, Dafydd (June 24, 2011). "BB King at Glastonbury 2011 – review". The Guardian. Retrieved May 15, 2015. ^ "Live at the Royal Albert Hall 2011". allMusic. Retrieved May 15, 2015. ^ "100 Greatest Guitarists". Rolling Stone. November 23, 2011. Retrieved May 15, 2015. ^ Compton, Matt (February 22, 2012). "President Obama Sings "Sweet Home Chicago"". The White House blog. Retrieved May 15, 2015. ^ Kelley, Frannie. "First Listen: Big K.R.I.T., 'Live From The Underground'". NPR. Retrieved May 28, 2012. ^ Mssawir, Elia (August 1, 2012). "Byblos Festival featured BB King among others in 2012". Demotix. Archived from the original on July 3, 2015. Retrieved May 15, 2015. ^ "B.B. King lived up to his legend at New Orleans Jazz Fest". NOLA.com. nola.com. Retrieved April 11, 2014. ^ "B.B. King Cancels Remaining 8 shows". bbking.com. October 4, 2014. Archived from the original on May 7, 2015. Retrieved May 15, 2015. ^ a b "Tour Update". bbking.com. October 8, 2014. Archived from the original on April 30, 2015. Retrieved May 15, 2015. ^ McMahon, Brian (November 19, 2014). "A Little Bit of Lefty Love". WIUX. Archived from the original on 2015-05-18. Retrieved May 14, 2015. ^ a b Willie G. Moseley (September 1995). "Remembering B.B. King". Vintage Guitar. ^ "One Customer's Pawnshop Treasure". Guitarcenterblog.com. December 3, 2009. Archived from the original on June 18, 2010. Retrieved May 16, 2011. ^ a b Category: Who Plays What. "B.B. King's Guitar Gear Rig and Equipment". Uberproaudio.com. Retrieved November 10, 2012. ^ "B.B. King Blues Club & Grill". B.B. King Blues Club & Grill. Retrieved 28 March 2019. ^ "The Official Website". Bbking.com. September 16, 1925. Retrieved February 17, 2010. ^ "Bb King: King's Clubs: 'good Memories, Good Times'". Allbusiness.com. Archived from the original on January 7, 2010. Retrieved February 17, 2010. ^ Abbott, Jim (November 30, 2007). "The Man Himself Opens New B.B. King's Blues Club". Orlando Sentinel. Retrieved May 15, 2015. ^ "West Palm Beach". Bbkingclubs.com. Retrieved February 17, 2010. ^ "Job Fair at B.B. King's Blues Club". Lasvegassun.com. September 3, 2009. Retrieved February 17, 2010. ^ Grunfeld, David (March 10, 2016). "B.B. and me: Remembering King of Blues though the years". www.nola.com. Retrieved April 8, 2019. ^ "BB King Performs At Luke's". YouTube. February 3, 1995. Retrieved June 8, 2007. ^ Sesame Workshop. "Sesame Street Beat Newsletter Archive". Archived from the original on September 30, 2007. Retrieved June 8, 2007. ^ Kiesewetter, John (April 2, 2000). "PBS Encourages Kids to Read Between the Lions". Enquirer. Retrieved May 15, 2015. ^ "Official Site". Bbking.com. Retrieved October 16, 2012. ^ Finn, Natalie (April 7, 2015). "Blues Legend B.B. King Hospitalized in Las Vegas". E! Online. Retrieved May 15, 2015. ^ "Boldness, Branding and B.B. King: Toyota Launches 2015 Camry Campaign". ^ "B.B. King (Blues Musician)". OnThisDay.com. Retrieved 28 March 2019. ^ a b c Johnson, S. Battle Over B.B. King's Fortune. The Hollywood Reporter, June 3, 2016 (No. 17), pp. 61-3. ^ a b Doughty, R. (2002). "King of the Blues BB King has Now Been At the Top of the Blues Game for More than 50 years" – via Diabetes Forecast. ^ Santilli, MJ (March 15, 2011). "Crystal Bowersox and BB King In New Diabetes Campaign". MJSBIGBLOG. Retrieved May 15, 2015. ^ West, Rebecca (April 20, 2000). "Interview with B.B. King". Blues on Stage. Retrieved March 14, 2010. ^ "You and Me with B.B. King." SIRIUS Channel 74. May 12, 2009. ^ Mitchell, Gail (June 29, 2007). "On the road again, B.B. King preps new album". Reuters. ^ King, B.B. ; Ritz, David (2011). Blues All Around Me. It Books. p. 266. ISBN 978-0062061034. ^ a b Back, Les. 2015. "How Blue can You Get? B.B. King, Planetary Humanism and the Blues Behind Bars." Theory, Culture & Society 32 (7): 274. ^ Adelt, U. "Black, White, and Blue: Racial Politics in B.B. King's Music from the 1960s". Journal of Popular Culture. 2. ^ "Honorary Board of Directors". Little Kids Rock. Retrieved May 15, 2015. ^ "How B.B. King Avoids the Diabetes Blues | Diabetes Health". Diabetes Health. 2005-11-01. Retrieved 2016-10-20. ^ "Crystal Bowersox: Striving to Live Without Limitations | Diabetes Health". Diabetes Health. 2013-01-17. Retrieved 2016-10-20. ^ a b "B.B. King Coroner's Report: No Evidence of Poisoning". Rollingstone.com. Retrieved July 15, 2015. ^ Ralph Ellis (May 2, 2015). "B.B. King "in home hospice care"". CNN. Retrieved May 15, 2015. ^ Oaklander, Mandy (May 16, 2015). "B.B. King Died From Mini Strokes, Coroner Says". TIME. Retrieved May 26, 2015. ^ Payne, Ed; Alsup, Dave. "B.B. King was poisoned, his daughters claim". CNN. Retrieved May 26, 2015. ^ "Coroner: No Evidence B.B. King Was Poisoned Before Death". The Huffington Post. July 13, 2015. Retrieved July 14, 2015. ^ Charlotte Alter (May 30, 2015). "B.B. King Buried in Indianola, Mississippi". Time.com. Retrieved May 30, 2015. ^ "Music And Tears At BB King Memphis Procession". News.sky.com. Retrieved May 30, 2015. ^ a b WMCActionNews5.com Staff (May 15, 2015). "Beale Street says goodbye to B.B. King — WMC Action News 5 - Memphis, Tennessee". WMC Action News 5. Retrieved May 30, 2015. ^ Associated Press in Indianola, Mississippi (January 1, 1970). "BB King's funeral draws hundreds as Obama says country 'has lost a legend' | US news". The Guardian. Retrieved May 31, 2015. ^ "Hundreds gather to farewell BB King". Melbourne: Theage.com.au. Retrieved May 31, 2015. ^ "Community news from The Centre Daily Times in State College, PA". centredaily.com. Archived from the original on July 15, 2015. Retrieved May 31, 2015. ^ "Singin' the Blues - B.B. King - Songs, Reviews, Credits". AllMusic. Retrieved 28 March 2019. ^ "Honorary Degrees Since 1702: 1977". Yale University. Retrieved May 15, 2015. ^ "B.B. King [Timeline]". The Rock and Roll Hall of Fame. Retrieved April 6, 2015. 1980: B.B. King is inducted into the first class of the Blues Foundation Hall of Fame. ^ "B.B. King". Retrieved September 12, 2014. ^ "Grammy Lifetime Achievement Award Winners". Grammy.com. February 8, 2009. Archived from the original on February 6, 2010. Retrieved February 17, 2010. ^ "List of National Medal of Arts Recipients". Nea.gov. Archived from the original on March 2, 2010. Retrieved February 17, 2010. ^ "NEA National Heritage Fellowships 1991". www.arts.gov. National Endowment for the Arts. Retrieved 2017-12-04. ^ "Kennedy Center Records". Kennedy-center.org. September 16, 1925. Archived from the original on August 5, 2009. Retrieved February 17, 2010. ^ "Grammy Database". Grammy.com. February 8, 2009. Archived from the original on February 13, 2010. Retrieved February 17, 2010. ^ "List of Presidential Medal of Freedom recipients". Senate.gov. Archived from the original on February 22, 2010. Retrieved February 17, 2010. ^ "Brown University to Confer Nine Honorary Degrees May 27". Brown.edu. Retrieved February 17, 2010. ^ Tyrangiel, Josh (August 14, 2009). "The 10 Greatest Electric-Guitar Players". Time. Retrieved January 6, 2011. ^ ""The Blues Heritage" Indianola, Mississippi Chamber of Commerce". Indianolams.org. Archived from the original on April 15, 2013. Retrieved February 17, 2010. ^ Mississippi Blues Commission. "B.B. King Birthplace". msbluestrail.org. Retrieved February 2, 2010.